"I was desperate to come up with some cucumber recipes after my garden mass produced the veggie. I find this is a refreshing treat, especially after mowing the yard. Serve over ice. Garnish with mint, as your taste dictates." Combine the cucumber, lime juice, sugar, and water in a food processor; puree. Good base recipe. I didn't have a lime, so I juiced one large lemon, instead. I also cut the sugar back to about 2 tbsp. and added some ginger for a kick. Yum! Feeling adventurous?! Try using this recipe for a refreshing Cucumber Martini and using chili seasoning made for fruit (check your produce section) on the rim! YUM!!! It was different, but very refreshing. Ice is a must, and mint is a nice addition too. I added a bit more sugar, but I have a sweet tooth! I recommend seeding the cucumber if you have time. We love it! 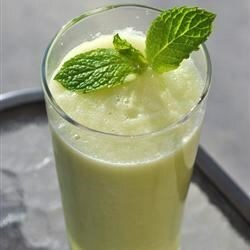 Simple, quick to make, yet extremely refreshing. We will be planting more cucumber plants next year for sure. thank you.